The nation’s economic discourse has finally shifted from talk of “grand bargain” budget deals to a focus on addressing the economic challenges of the middle class and those aspiring to join the middle class. Growing the economy from the “middle out” has become the new frame for discussing economic policy. This is long overdue; in our view, an economy that does not provide shared prosperity is, by definition, a poorly performing one. Further, such an economy will not provide sustainable growth without relying on consumption fueled by asset bubbles and escalating household debt. The collapse of the housing bubble and the ensuing Great Recession have laid bare the consequences of this model of unbalanced growth. The revived discussion of strengthening the middle class, however, has so far failed to drill down to the central problem: The wage and benefit growth of the vast majority, including white-collar and blue-collar workers and those with and without a college degree, has stagnated, as the fruits of overall growth have accrued disproportionately to the richest households. The wage-setting mechanism has been broken for a generation but has particularly faltered in the last 10 years, once the robust wage growth of the late 1990s subsided. Corporate profits, on the other hand, are at historic highs. Income growth has been captured by those in the top 1 percent, driven by high profitability and by the tremendous wage growth among executives and in the finance sector (for more on wage and income growth among the top 1 percent, see Bivens and Mishel 2013). In the period after World War II, a growing middle class was the engine of our prosperity. Whether you owned a company, swept its floors, or worked anywhere in between, this country offered you a basic bargain—a sense that your hard work would be rewarded with fair wages and benefits, the chance to buy a home, to save for retirement, and, above all, to hand down a better life for your kids. But over time, that engine began to stall. That bargain began to fray. . . . The link between higher productivity and people’s wages and salaries was severed—the income of the top 1 percent nearly quadrupled from 1979 to 2007, while the typical family’s barely budged. With new American revolutions in energy, technology, manufacturing, and health care, we are actually poised to reverse the forces that have battered the middle class for so long, and rebuild an economy where everyone who works hard can get ahead. Innovations in energy, technology, manufacturing, and health care are undoubtedly important. However, in and of themselves, they will not reestablish the broad-based wage growth and improved job quality needed to generate and sustain middle-class income growth. Nor will they, on their own, permit access to a rising middle class for those now left behind. EPI’s The State of Working America, 12th Edition (Mishel et al. 2012) provides a comprehensive assessment of recent decades’ wage and benefits trends and an extensive analysis of the causes of wage stagnation and wage inequality. In this paper we document the economy’s continuing failure to provide real wage gains for most workers. We track wage trends (and, where possible, compensation trends, which include not just wages but also fringe benefits such as health care and pensions) using both employer-based and household-based survey data. We focus primarily on trends since 2007, the year the Great Recession began. We generally examine year-over-year trends using calendar years, though to assess the most recent trends we also include year-over-year trends using just the first half of each year. We also discuss these trends in the context of patterns since 2000, as the 2000–2007 business cycle—and especially the recovery years of that business cycle, 2002–2007—were characterized by dismal wage growth. In some cases we provide data going back to 1979, as most workers have experienced weak wage growth for more than three decades. According to every major data source, the vast majority of U.S. workers—including white-collar and blue-collar workers and those with and without a college degree—have endured more than a decade of wage stagnation. Wage growth has significantly underperformed productivity growth regardless of occupation, gender, race/ethnicity, or education level. During the Great Recession and its aftermath (i.e., between 2007 and 2012), wages fell for the entire bottom 70 percent of the wage distribution, despite productivity growth of 7.7 percent. Weak wage growth predates the Great Recession. Between 2000 and 2007, the median worker saw wage growth of just 2.6 percent, despite productivity growth of 16.0 percent, while the 20th percentile worker saw wage growth of just 1.0 percent and the 80th percentile worker saw wage growth of just 4.6 percent. The weak wage growth over 2000–2007, combined with the wage losses for most workers from 2007 to 2012, mean that between 2000 and 2012, wages were flat or declined for the entire bottom 60 percent of the wage distribution (despite productivity growing by nearly 25 percent over this period). Wage growth in the very early part of the 2000–2012 period, between 2000 and 2002, was still being bolstered by momentum from the strong wage growth of the late 1990s. Between 2002 and 2012, wages were stagnant or declined for the entire bottom 70 percent of the wage distribution. In other words, the vast majority of wage earners have already experienced a lost decade, one where real wages were either flat or in decline. This lost decade for wages comes on the heels of decades of inadequate wage growth. For virtually the entire period since 1979 (with the one exception being the strong wage growth of the late 1990s), wage growth for most workers has been weak. The median worker saw an increase of just 5.0 percent between 1979 and 2012, despite productivity growth of 74.5 percent—while the 20th percentile worker saw wage erosion of 0.4 percent and the 80th percentile worker saw wage growth of just 17.5 percent. We first look at wage and compensation trends using data drawn from the available surveys of employers, sometimes referred to as establishment data. All of the establishment-based series that provide up-to-date national measures of wage and/or compensation trends are presented in Table 1. It should be noted that the wage and compensation data in this table are averages, which are all that are available in the establishment data. Averages can be misleading when data are heavily “skewed” at one end. This happens to be the case for U.S. wages and compensation; those at the top have extremely high earnings, thereby pulling up the average. Thus, the average is actually not an accurate measure of the typical worker’s earnings. Later, when we turn to an examination of household data, we are able to look at medians, which are a direct measure of the earnings of the typical worker (i.e., the person in the middle of the distribution). The data demonstrate, however, that across all of the available establishment-based measures, even average wages and compensation have grown anemically, if at all, for more than a decade. * Authors' own calculation of compensation and wages from ECEC data. "Wages" to include pay such as paid leave and supplemental pay to reflect W-2 wages. "Compensation" is adjusted by deflating insurance costs by the CPI-U Medical Care and the non-insurance costs by the CPI-U-RS. ** The ECEC for 2000 only reflects the 1st quarter because ECEC only began collecting data for all four quarters in 2002. *** Year-over-year growth rates are the change from the 1st half to 1st half, except for the ECEC, which is from the 1st quarter to 1st quarter. During the Great Recession and its aftermath (i.e., between 2007 and 2012), economy-wide productivity grew 7.7 percent. Table 1 shows that across all available measures, wage and compensation growth lagged far behind productivity. Compensation grew 0.9 percent as measured by the Labor Productivity and Costs (LPC) program, was flat (grew 0.0 percent) as measured by the Employment Cost Index (ECI), and fell 0.6 percent as measured by the Employer Costs for Employee Compensation (ECEC) program.1 In the ECI, wage growth was even weaker than compensation growth, declining 0.7 percent, and in the ECEC, the drop in wages matched the drop in compensation, declining 0.6 percent. As for the Current Establishment Survey (CES), which is the survey used to track payroll job growth each month, there are two measures of wage growth available: one for all private-sector workers and one for private-sector “production and nonsupervisory workers” (who comprise 82 percent of private-sector payroll employment, excluding typically higher-paid managers and supervisors). Average hourly wages of all private-sector workers and of production and nonsupervisory workers increased modestly between 2007 and 2012, by 1.2 percent and 2.4 percent, respectively. The most recent data, covering in most cases changes between the first half of 2012 and the first half of 2013 (the last line of data in Table 1), show that wage and compensation growth remains bleak. Compensation as measured by the LPC program fell 0.3 percent, whereas it grew 0.3 percent according to the ECI and dropped 0.6 percent according to the ECEC. Wages grew 0.3 percent as measured by the ECI, dropped 0.7 percent as measured by the ECEC, and increased only 0.5 percent and 0.3 percent for all private-sector workers and for production and nonsupervisory workers, respectively, in the CES. In short, this is what wage and compensation stagnation looks like. However, these latest data were largely an improvement from the prior year’s data (2011–2012), which show wages and compensation declining according to every measure. Unfortunately, it is unlikely that the acceleration in wages and compensation over the past year will continue. First, much of this acceleration of real wage growth was due to a drop in inflation between the two periods (from 2.3 percent to 1.5 percent, as shown in Table 1). This means there was little acceleration in nominal wage growth over this period. Additionally, a substantial part of the slowdown in inflation was due to a slowdown in the prices of food and energy, which are volatile from year to year.2 These prices are likely to bounce back, pulling down the growth of real wages moving forward (though core inflation, which excludes the volatile food and energy items, is expected to remain subdued due to the weak economy). Furthermore, with continued high unemployment, wage growth is unlikely to accelerate much in the next few years. With so few outside job opportunities, employers simply do not have to offer strong wage increases to get and keep the workers they need. Another key point that Table 1 demonstrates is that wage and compensation growth was weak even before the Great Recession began. Between 2000 and 2007, the last full business cycle before the start of the Great Recession, productivity grew 16.0 percent. However, compensation grew by just 9.4 percent over this period as measured by the LCP program, by only 5.5 percent in the ECI, and by just 7.2 percent in the ECEC. Wages grew just 2.4 percent as measured by the ECI, 5.0 percent as measured by the ECEC, and 3.3 percent for production and nonsupervisory workers in the CES. The weak wage and compensation growth in the 2000–2007 business cycle, combined with the even weaker growth in the Great Recession and its aftermath, mean that average wage and compensation growth was far outpaced by productivity growth between 2000 and 2012. Furthermore, wage and compensation growth in the first few years of this period was still being buoyed by the momentum of the strong wage and compensation growth of the late 1990s. Figure A shows year-by-year productivity growth along with compensation growth as measured by the ECI and the ECEC since 2000. It shows that there has been no sustained growth in average compensation since 2004. 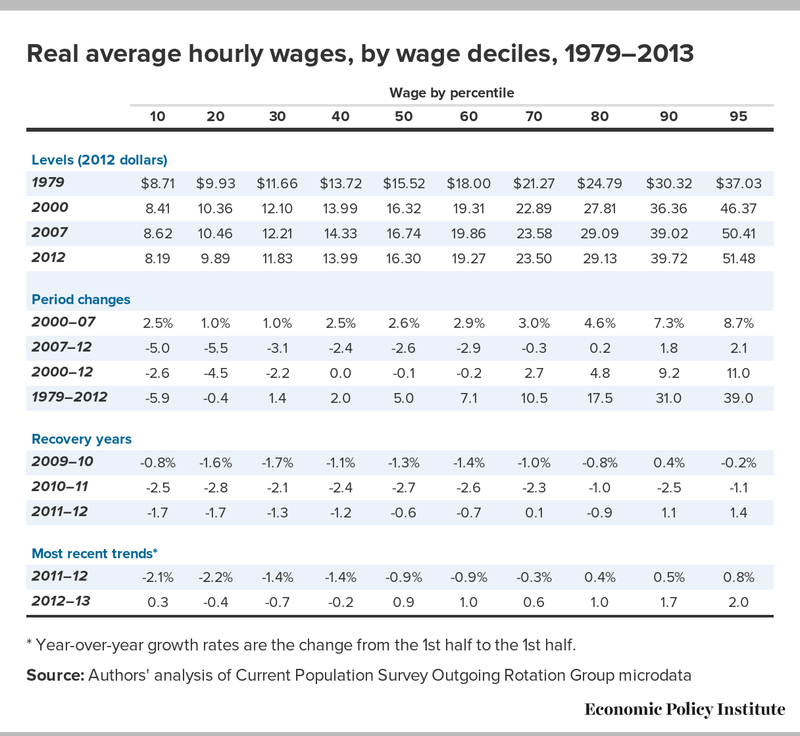 The stagnation began even earlier, in 2003, when considering wages alone. 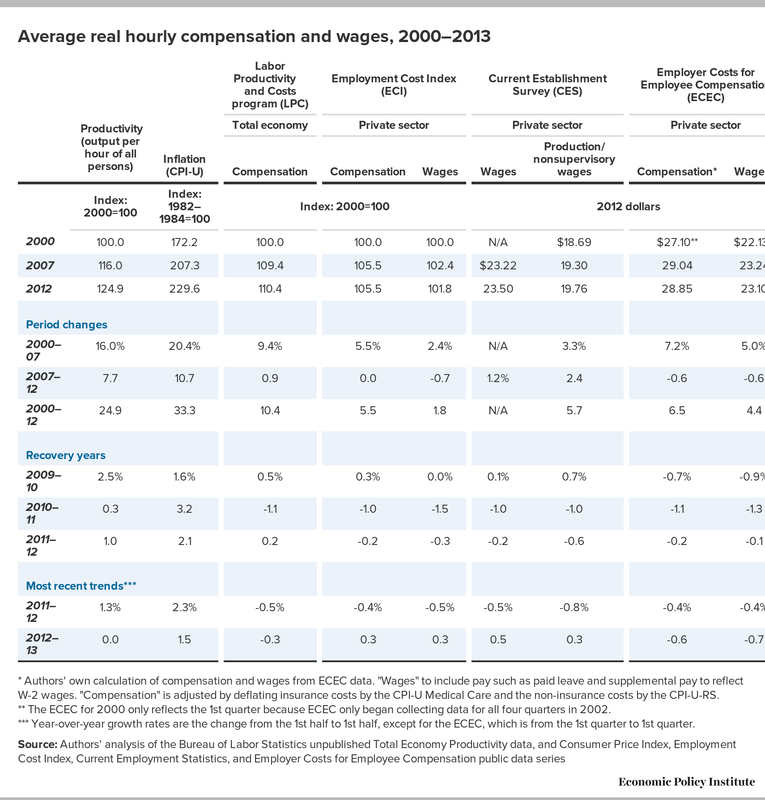 Since 2003, wages as measured by both the ECI and the ECEC (not shown) have not grown at all—a lost decade for wages. Note: Productivity series reflects the total economy, while ECI and ECEC reflect the compensation of all private workers. ECEC data are linearly interpolated between 2000Q1–2001Q1 and 2001Q1–2002Q1 (no formal data exist for quarters two, three, or four in 2000 or 2001). Only the ECI had data available for 2013Q2. * Year-over-year growth rates are the change from the 1st half to the 1st half. Between 2007 and 2012, compensation for all private-sector occupations combined was unchanged (0.0 percent growth, as shown in Table 2), despite productivity growth of 7.7 percent. Stagnant compensation was not restricted to certain types of jobs, but was instead the norm in white-collar, blue-collar, and service jobs, with little variation among occupational categories. Among white-collar occupations, compensation remained unchanged for managers and professionals, while it declined 2.2 percent for sales jobs (which include retail sales jobs but also stock and real estate brokers, and insurance and travel agents) and increased 1.0 percent for office and administrative jobs. Among blue-collar occupations, compensation remained unchanged for construction and natural resources jobs, while it grew 1.0 percent for installation and maintenance jobs and increased 0.6 percent for production and transportation jobs. In service jobs, compensation declined by 0.4 percent. Over the last year, from the first half of 2012 to the first half of 2013, compensation among all occupations combined grew just 0.3 percent, partially reversing the 0.4 percent decline from the first half of 2011 to the first half of 2012. Across occupational categories there was little variation (ranging from growth of 0.1 percent over the last year in construction and service occupations to a 0.6 percent increase in installation and maintenance). However, this modest acceleration in real compensation stems partly from a deceleration of inflation that is unlikely to continue. Another trend Table 2 highlights is that weak compensation growth across occupational categories did not begin with the Great Recession. 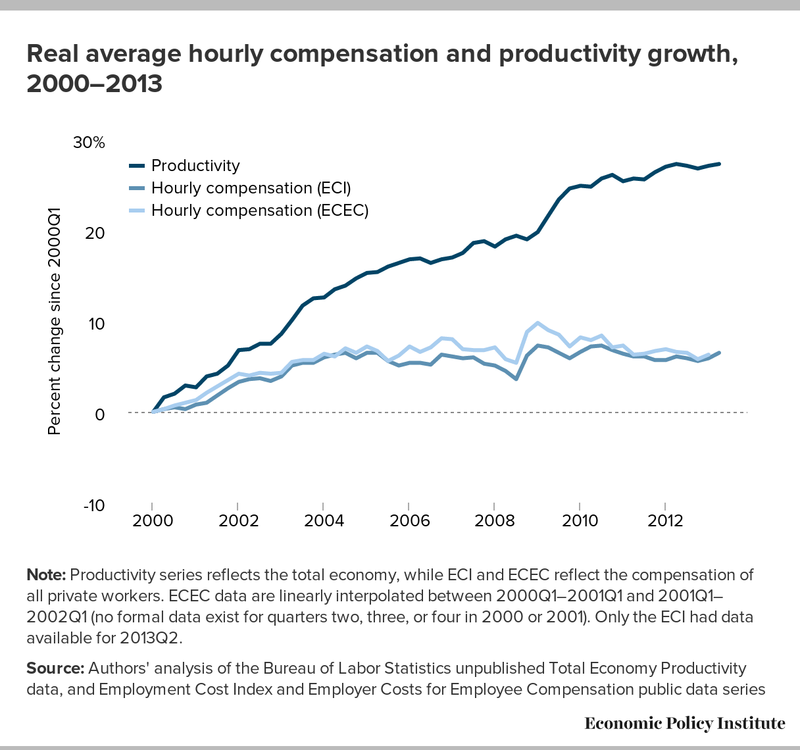 Between 2001 and 2007, when productivity grew 13.5 percent (not shown), overall compensation grew only 4.2 percent. In this period, too, stagnant compensation was the norm across all occupations, with compensation growth ranging from 2.5 percent in service jobs and in production and transportation jobs to 5.9 percent in construction and natural resources jobs. Combining these two periods reveals that in the 11-year period from 2001 to 2012, during which productivity grew 22.2 percent, compensation grew just 4.2 percent overall, with weak growth in all occupational categories. Furthermore, compensation in the first part of this period was still buoyed by the momentum from the strong labor markets of the late 1990s. Once that faded, there was very little compensation growth. 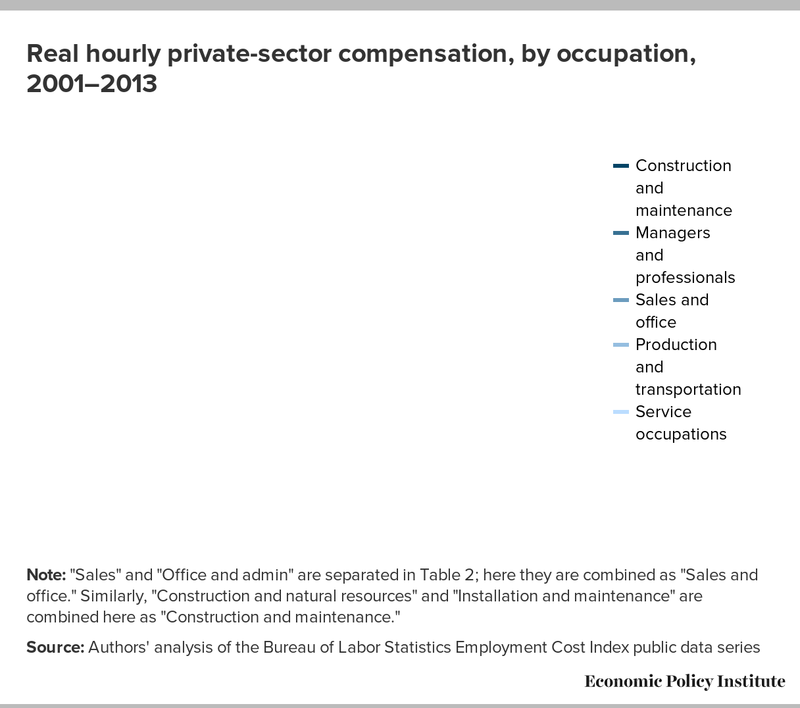 Since 2004, compensation has not increased in most occupational categories, as shown in Figure B. The stagnation began even earlier, in 2003, when examining wages alone; since the fourth quarter of 2003, wages have declined overall and in all major occupational categories (not shown). Note: "Sales" and "Office and admin" are separated in Table 2; here they are combined as "Sales and office." Similarly, "Construction and natural resources" and "Installation and maintenance" are combined here as "Construction and maintenance." The remaining sections turn to an examination of wages using the Current Population Survey, which collects data on wages from households each month (and also, for example, provides the monthly unemployment rate). These data are based on information from the workers themselves, as opposed to employers. One advantage of such data is that they permit us to look at not just average growth rates, but also at the wage growth of workers at various points in the wage distribution (i.e., we are able to track wage growth for low earners, middle-range earners, and high earners). In later sections, we also use these data to look at wage growth for different demographic breakdowns, including breakdowns by gender, education, and race/ethnicity. During the Great Recession and its aftermath (i.e., between 2007 and 2012), wages fell for the entire bottom 70 percent of the wage distribution, despite productivity growth of 7.7 percent. The losses tended to be larger further down the wage distribution; wages at the 80th percentile were essentially flat (increasing by 0.2 percent), the median (50th percentile) worker saw a decline of 2.6 percent, and the 20th percentile worker saw a decline of 5.5 percent over this period. This is typical; high unemployment hurts wage growth across the wage distribution, but its impact is more negative further down the wage distribution (see Mishel et al. 2012, 242–246). 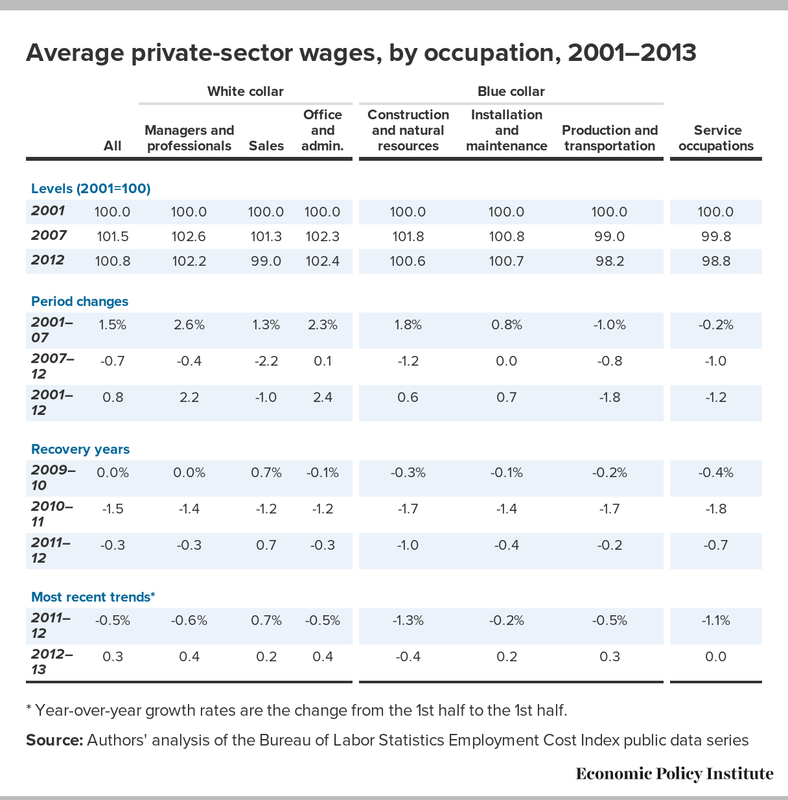 The first two years of the recovery, 2009–2011, were particularly bleak years for wage growth, with losses across the board. There was also wage erosion for almost the entire bottom 80 percent of wage earners for the last full-year comparison available, 2011–2012. The most recent data show some modest improvement: From the first half of 2012 to the first half of 2013, the 80th percentile worker saw an increase of 1.0 percent, the median worker saw an increase of 0.9 percent, and the 20th percentile worker saw a decline of “just” 0.4 percent. However, most of the improvement in real wage growth was due to particularly subdued inflation over the last year (1.5 percent, down from 2.3 percent, as shown in Table 1), meaning there has not been much acceleration in nominal wage growth. With continued high unemployment, wage growth is unlikely to accelerate much in the next few years. As mentioned previously, with few outside job opportunities, employers do not have to offer substantial wage increases to get and keep the workers they need. Another important point that Table 4 highlights is that weak wage growth for most workers was not a new phenomenon emerging in the recessionary years since 2007. Between 2000 and 2007, the median worker saw wage growth of just 2.6 percent, despite productivity growth of 16.0 percent, while the 20th percentile worker saw wage growth of just 1.0 percent and the 80th percentile worker saw wage growth of just 4.6 percent. The weak wage growth over 2000–2007, combined with the wage losses for most workers from 2007 to 2012, mean that between 2000 and 2012, wages were flat or declined for the entire bottom 60 percent of the wage distribution (despite productivity growing by nearly 25 percent over this period). Furthermore, wage growth in the very early part of this period, between 2000 and 2002, was still being bolstered by momentum from the strong wage growth of the late 1990s. 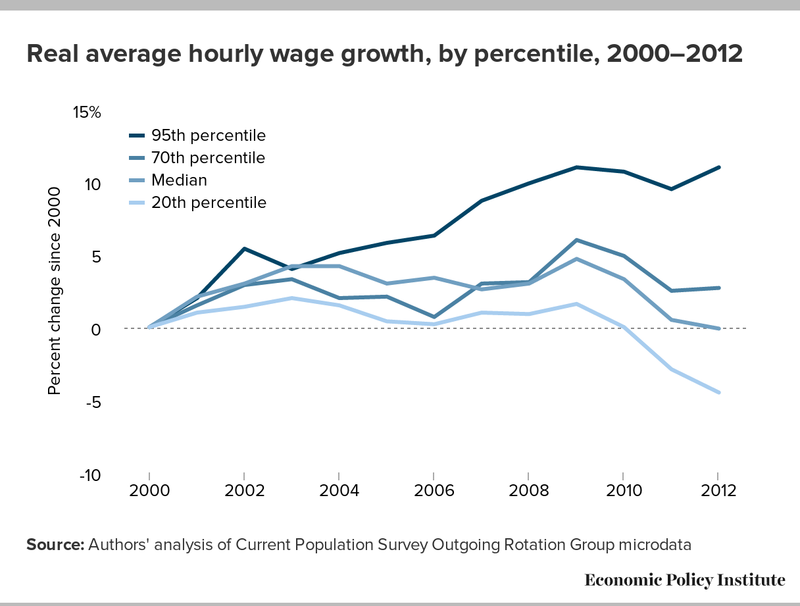 Figure C shows that between 2002 and 2012, wages were stagnant or declined for the entire bottom 70 percent of the wage distribution. In other words, the vast majority of wage earners have already experienced a lost decade, one where real wages were either flat or in decline. Finally, Table 4 also highlights that for virtually the entire period since 1979 (with the one exception being the strong wage growth of the late 1990s, not shown), wage growth for most workers has been weak. The median worker saw an increase of just 5.0 percent between 1979 and 2012, despite productivity growth of 74.5 percent, while the 20th percentile worker saw wage erosion of 0.4 percent and the 80th percentile worker saw wage growth of just 17.5 percent. 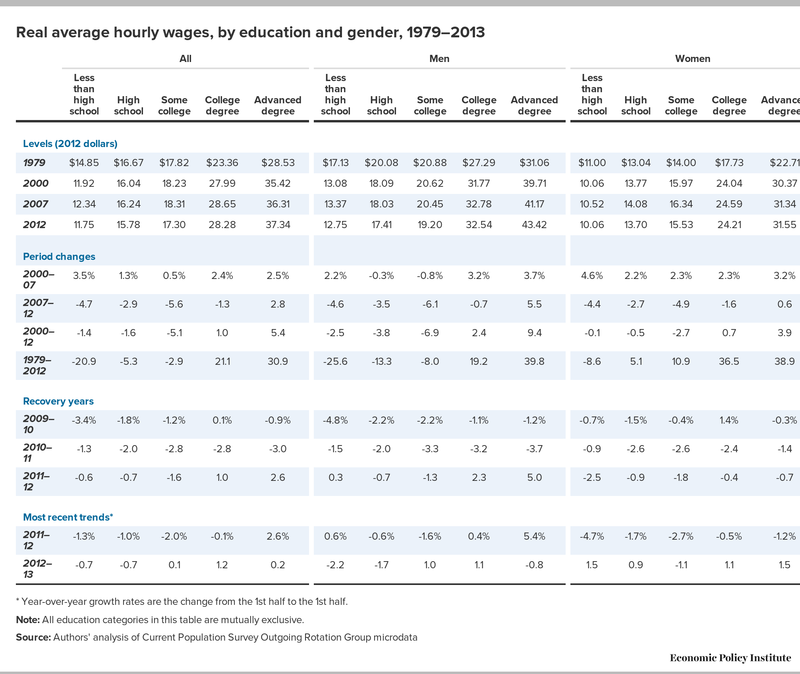 We now turn to an examination of wage trends for various demographic groups; Table 5 shows average hourly wages by education and gender.3 Between 2007 and 2012, only workers with an advanced degree (who were just 11.4 percent of the workforce in 2012) have seen any wage growth—wages declined for all other education groups, from high school dropouts to those with a bachelor’s degree. Male workers with a bachelor’s degree saw a decline of 0.7 percent over this period, and those with a high school degree saw a decline of 3.5 percent. In comparison, female workers with a bachelor’s degree saw a decline of 1.6 percent, and those with a high school degree saw a decline of 2.7 percent. Wage growth was particularly weak from 2009 to 2011, the first two years of the recovery, with losses across the board—even for those with an advanced degree. The most recent data show some improvement for some groups. From the first half of 2012 to the first half of 2013, workers with a college degree or more have seen some growth (1.2 percent for those with a bachelor’s degree and 0.2 percent for those with an advanced degree), but those with a high school degree or less continued to see losses (-0.7 percent). 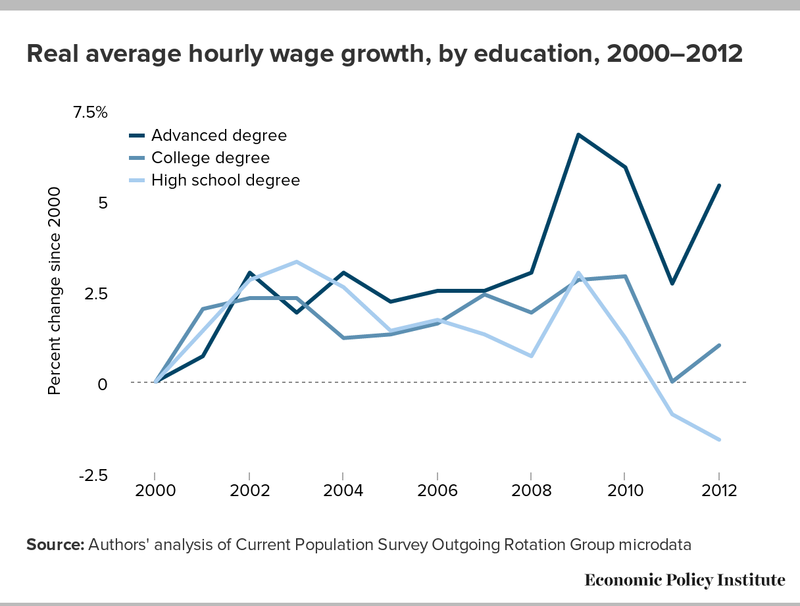 The wage losses for workers at most education levels between 2007 and 2012 came on the heels of a business cycle from 2000 to 2007 characterized by weak wage growth across the education spectrum. Workers with a college degree saw wage growth of just 2.4 percent between 2000 and 2007, despite productivity growth of 16.0 percent over this period. Wage growth for workers with a high school degree was even lower, at 1.3 percent. Combining the two periods (2000–2007 and 2007–2012) reveals that though productivity grew by 24.9 percent between 2000 and 2012, the wages of workers with a college degree increased by only 1.0 percent, while the wages of those with a high school degree fell by 1.6 percent. Furthermore, as mentioned previously, wage growth in the early part of this period was spurred by the remaining momentum from the strong wage growth of the late 1990s. As can be seen in Figure D, wages of workers with a bachelor’s degree were lower in 2012 than in 2002, 10 years earlier. Real wage gains have eluded the vast majority over the last 10 years, including those with college degrees. This has even been true for those in science, technology, engineering, and mathematics occupations (see Figure K of Salzman, Kuehn, and Lowell 2013) and for those in business occupations (see Table 4.45 of Mishel et al. 2012). The college wage premium, presented in Figure E, is the wage gap between (four-year) college graduates and high school graduates. It shows the percent by which the wages of college graduates exceed those of “otherwise equivalent” high school graduates (“otherwise equivalent” means that the premium is calculated using a regression analysis that controls for differences in factors such as age, marital status, race, ethnicity, and region of residence). The college wage premium for both men and women grew strongly in the 1980s, increasing 13.8 percentage points for men and 15.0 percentage points for women between 1979 and 1989. In other words, over this period the wages of those with a college degree were rapidly pulling away from the wages of those with just a high school degree. The growth rate slowed dramatically in the 1990s, however, with the college wage premium growing 8.0 percentage points for men and 7.9 percentage points for women between 1989 and 2000 (with most of the growth for women occurring in the first half of the decade, and most of the growth for men occurring in the second half). The growth rate slowed even further in the 2000s, with the college wage premium growing just 4.1 percentage points for men between 2000 and 2012 and growing less than a percentage point for women. Figure E underscores that while workers with a college degree earn higher wages than otherwise similar workers with just a high school degree, the era of the rapidly rising college wage premium is behind us—and this has been true for more than a decade. Note: All education categories in this table are mutually exclusive. 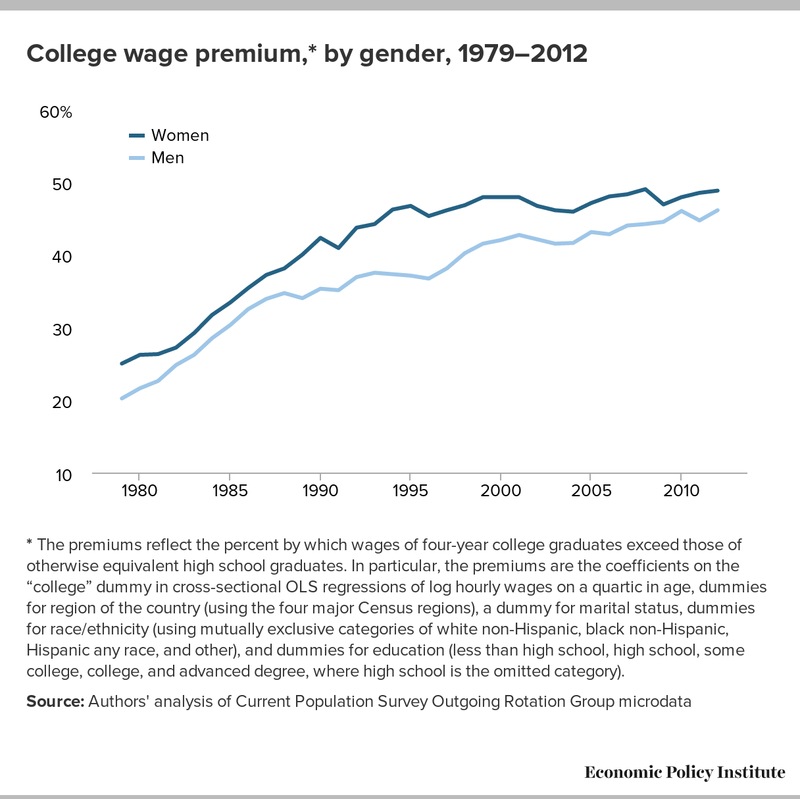 * The premiums reflect the percent by which wages of four-year college graduates exceed those of otherwise equivalent high school graduates. In particular, the premiums are the coefficients on the “college” dummy in cross-sectional OLS regressions of log hourly wages on a quartic in age, dummies for region of the country (using the four major Census regions), a dummy for marital status, dummies for race/ethnicity (using mutually exclusive categories of white non-Hispanic, black non-Hispanic, Hispanic any race, and other), and dummies for education (less than high school, high school, some college, college, and advanced degree, where high school is the omitted category). We now turn to wage trends by gender and race/ethnicity. The best data series for this analysis is the Bureau of Labor Statistics series on the median weekly earnings of full-time workers (as opposed to the hourly earnings of both full- and part-time workers combined, which have until this point been the focus of this paper). Theoretically, weekly earnings combine the impact of both changes in the growth in hourly wages and changes in hours worked per week, and therefore provide a clearer sense of what is occurring with workers’ paychecks. However, because the data are restricted to full-time workers (people who work 35 hours per week or more), the effect of changing hours on paychecks will not be a major factor in this analysis. Table 6 shows median weekly earnings of full-time workers by race, ethnicity, and gender, both for employed people of working age (age 16 and over) and “prime-age” (age 25–54) workers, the latter range capturing the ages of highest labor force participation in the U.S. labor market. Note: "Full-time workers" are defined as those working 35 or more hours per week. Between 2007 and 2012, median weekly earnings of full-time workers overall were essentially flat—declining by 0.2 percent from $770 to $768—despite productivity growing by 7.7 percent over this period. Some of that lack of growth was due to more job loss among men, who have higher wages on average. However, looking by gender we still find weekly wage growth of full-time workers far outstripped by productivity growth. For full-time men, weekly wages grew 0.7 percent over this period. White men saw a 0.7 percent increase from $873 to $879; black men saw virtually no change, increasing from $664 to $665; and the earnings of Hispanic men increased 2.8 percent, from $576 to $592. For full-time women, weekly wages grew 1.6 percent over this period. White women saw an increase of 2.4 percent, from $693 to $710; black women saw a 1.5 percent increase, from $590 to $599; and Hispanic women saw a 0.5 percent decline, from $524 to $521. Full-time prime-age (age 25–54) men and women fared worse than the larger population of working-age men and women; prime-age men saw a 0.7 percent decline over this period, while prime-age women saw a 0.8 percent increase. Most recently, from the first half of 2012 to the first half of 2013, wages declined virtually across the board, with the exceptions being for white and Hispanic women, who saw modest increases (0.4 percent and 1.3 percent, respectively, both helping to offset declines in the prior year). 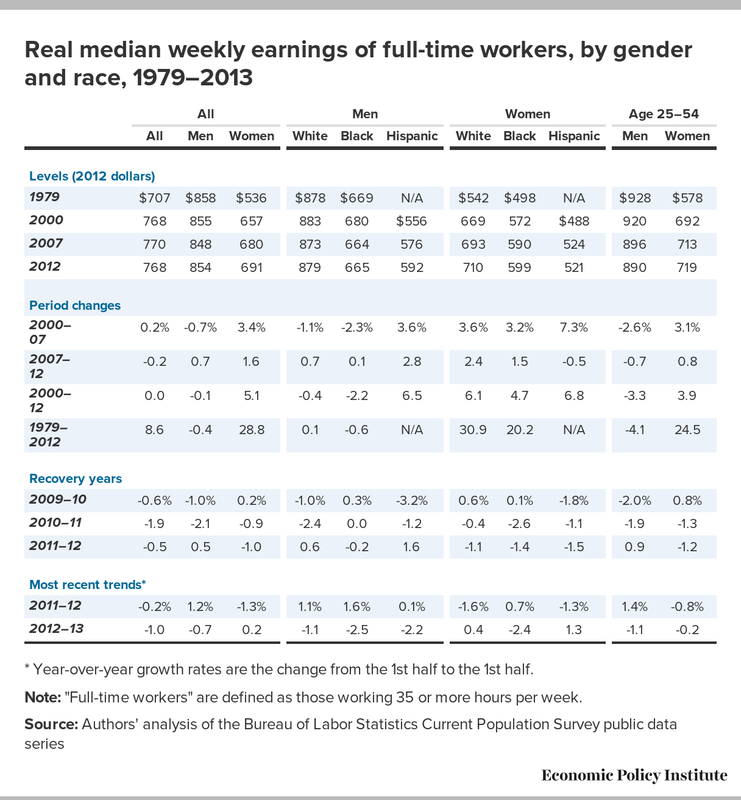 Overall, median weekly earnings of full-time workers declined by 1.0 percent over the last year. For prime-age men they declined by 1.1 percent, and for prime-age women they declined by 0.2 percent. The poor performance over the last year of weekly wage growth for full-time workers—particularly that of full-time, prime-age men—stands in contrast to the somewhat stronger growth over the last year in real hourly wages of full- and part-time workers combined discussed earlier in the paper. Again it is important to note that the poor wage performance during the Great Recession and its aftermath came on the heels of a very weak business cycle from 2000 to 2007. The median weekly wage of full-time workers increased by just 0.2 percent between 2000 and 2007, though productivity grew 16.0 percent over this period. Men fared worse than women in terms of wage growth over this period; male full-time workers saw a weekly wage decline of 0.7 percent between 2000 and 2007, while the weekly wages of female full-time workers increased by 3.4 percent. Looking at the whole 12-year span from 2000 to 2012, when productivity grew by nearly 25 percent, we find that the weekly wages of full-time male workers were stagnant, dropping by 0.1 percent from $855 to $854, while the weekly wages of full-time female workers increased just 5.1 percent, from $657 to $691. For prime-age workers the situation was even bleaker; from 2000 to 2012, the weekly wages of full-time, prime-age male workers dropped 3.3 percent, and the weekly wages of full-time, prime-age female workers increased just 3.9 percent. The weak wage growth since 1979 for all but those with the highest wages is the result of intentional policy decisions—including globalization, deregulation, weaker unions, and lower labor standards such as a weaker minimum wage—that have undercut job quality for low- and middle-wage workers. These policies have all been portrayed to the public as giving American consumers goods and services at lower prices. Whatever the impact on prices, these policies have lowered the earnings power of low- and middle-wage workers such that their real wages severely lag productivity growth. Macroeconomic policies have often added to the forces disempowering the vast majority of workers by tolerating (or causing) unnecessarily high unemployment rates to forestall (often hypothetical) increases in inflation or interest rates. To generate wage growth, we need to rapidly lower unemployment, which in the current moment can only be reliably accomplished through expansionary fiscal policy—particularly large-scale ongoing public investments and the reestablishment of state and local public services that were cut in the Great Recession and its aftermath. The priority has to be jobs now, rather than any deficit reduction (which under current conditions will sap demand for goods and services and slow job growth). On top of lowering unemployment, policy should also aim to restore the bargaining power of low- and middle-wage workers. This means aggressively increasing the minimum wage so that it eventually grows to half the average worker’s wage. It means reestablishing the right to collective bargaining for higher wages and addressing workplace concerns. It means not allowing immigration policy to be dictated by employers’ desire to bring in guestworkers lacking basic labor market protections in order to undercut wages in both high-wage and low-wage occupations. Instead, guestworkers should have full rights to the same labor market protections as resident workers, and such programs should be allowed only to relieve rigorously documented episodes of genuine labor shortages. It means establishing citizenship for undocumented workers who are currently vulnerable to exploitation. It means taking executive action to ensure that federal dollars are not spent employing people in jobs with poverty-level wages. Overall, it means paying attention to job quality and wage growth as the key priorities in economic policymaking and as mechanisms for economic growth and economic security for the vast majority. — Research assistance provided by William Kimball. Lawrence Mishel has been president of the Economic Policy Institute since 2002. Prior to that he was EPI’s first research director (starting in 1987) and later became vice president. He is the co-author of all 12 editions of The State of Working America. He holds a Ph.D. in economics from the University of Wisconsin-Madison, and his articles have appeared in a variety of academic and non-academic journals. His areas of research are labor economics, wage and income distribution, industrial relations, productivity growth, and the economics of education. Heidi Shierholz joined the Economic Policy Institute as an economist in 2007. She conducts research on employment, unemployment, and labor force participation; the wage, income, and wealth distributions; the labor market outcomes of young workers; unemployment insurance; the minimum wage; and the effect of immigration on wages in the U.S. labor market. She previously worked as an assistant professor of economics at the University of Toronto, and she holds a Ph.D. in economics from the University of Michigan-Ann Arbor. 1. Compensation in the Labor Productivity and Costs program is for the total economy. Compensation and wages in both the ECI and the ECEC are for the private sector only. 2. The increase in the price of food dropped from 3.3 percent between the first half of 2011 and the first half of 2012 to 1.5 percent between the first half of 2012 and the first half of 2013, while the change in the price of energy dropped from a 1.7 percent increase to a 0.3 percent decrease over the same period. 3. All education categories displayed in Table 5 and discussed in this section are mutually exclusive. For example, “workers with a bachelor’s degree” refers to those with a bachelor’s degree and no further education; it does not include those with an advanced degree. Current Population Survey public data series. Various years. Aggregate data from basic monthly CPS microdata are available from the Bureau of Labor Statistics through three pri­mary channels: as Historical ‘A’ Tables released with the BLS Employment Situation Summary (http://www.bls.gov/data/#historical-tables), through the Labor Force Statistics Including the National Unemployment Rate database (http://www.bls.gov/cps/#data), and through series re­ports (http://data.bls.gov/cgi-bin/srgate). Salzman, Hal, Daniel Kuehn, and B. Lindsay Lowell. 2013. Guestworkers in the High-Skill U.S. Labor Market: An Analysis of Supply, Employment, and Wage Trends. Economic Policy Institute, Briefing Paper #359. http://www.epi.org/publication/bp359-guestworkers-high-skill-labor-market-analysis/.